Oliver plays as session bassist in Blind Guardian since 1998, when Hansi has abandoned the bass to focus completely on singing. 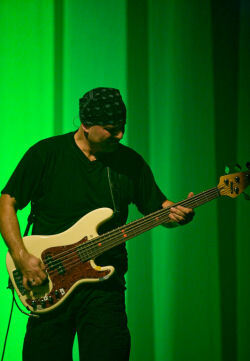 Although not included in the line-up (the group would remain a quartet), Oliver has played in every album and every concert since "Nightfall In Middle-Earth". He has participated at some projects like Paradox, Coldseed (where he worked alongside Thomas and Michael), Val'Paraiso, Demons & Wizards or Sieges Even. He has formed in September 2008 a rhythm section with his brother Alex to offer their services to each group wishing to work with them : Best Of Both Worlds - The Holzwarth Brothers. In 2012, he left Blind Guardian for working only with Rhapsody Of Fire.